On January 30th, the New York Times announced that Chinese hackers had infiltrated its own computers for the past four months, following its report published in late October on the business fortune that the family of the Prime Minister, Wen Jiabao has developped. 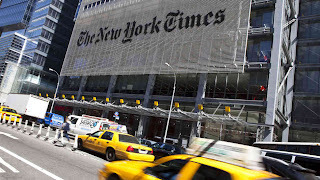 Chinese hackers who attached the New York Times managed to grab e-mails and documents by snitching into the emails account of the Shanghai bureau chief, David Barboza, who wrote the report about Wen Jiabao, and the email account of the former Beijing bureau chief Jim Yardley, current head of the South Asia Office in India. On January 31th, the Wall Street Journal has also reported that its computers had been affected by Chinese cybercriminals and denounced Beijing attempts to spy on journalists. The Wall Street Journal said that these attacks were “an apparent attempt to control the coverage of China” by its journalists, and suggests that the Chinese practice of spying on American media had become “a common phenomenon.” “There is evidence that these efforts are aimed at controlling the infiltration by the newspaper coverage of China, and not by commercial gain or to divert customer information,” said Paula Keve, agency Dow Jones which is also part of the Wall Street Journal News Corp. magnate Rupert Murdoch. We do not know when these attacks against The Wall Street Journal have started but a review of its computer network to enhance security has already begun. “We fully intend to continue our practice of journalism in a fighter and independent spirit,” said Paula Keve. That same day on January 31th, CNN also announced that the computer system of its international service had been blocked for several minutes in response to its report on piracy in the New York Times. “CNNI has gone black for six minutes” tweeted one of the journalists Hala Gorani of CNN International. “China has blocked CNN because of Hala Gorani being interviewed about the hacking of the New York Times,” could be read on twitter. In Beijing, the official response was fast to come. “The Chinese authorities have responded clearly to unfounded accusations of The New York Times,” told Hong Lei, the spokesman of the Foreign Ministry to reporters. “China is also a victim of cyberattacks (…) Chinese law prohibits such attacks and we hope that all stakeholders will adopt a responsible attitude on this issue,” he added. Last but not least, on Friday, February 1st the social network Twitter has announced that some of its users have also been victims of cyberattacks which were similar to those brought against the New York Times and the Wall Street Journal, pointing their finger at government. Chinese hackers have managed to take names, email addresses, passwords and other data from approximately 250,000 users, said the security director of Twitter, on the blog network. “This attack was not the work of amateurs, and we believe it was not an isolated incident,” said the head of Twitter, based in California. “The attackers were extremely sophisticated, and we believe other companies and institutions have recently been attacked in the same way,” he added. “We stumbled on an ongoing attack and we manage to stop it later,” he reported, noting they have had to invalidate some account passwords of potentially affected users and have asked them to recreate their password. The VPN technology allows you to establish an encrypted VPN tunnel to a host (or server) on the Internet. Thus, you can surf anonymously, as it is impossible for others to intercept your traffic through our VPN server. Your Internet activity is undetectable! Le VPN has several servers located in different places and that you can connect easily. These servers allow you to hide your IP address and other personal information to stay secret, regardless of how you are connected.